Please notify us within 30 days of receipt of your order if you need to return or exchange your order (we do not accept returns on doors). If your hardware has been altered in any way it cannot be returned. Custom hardware cannot be returned. The Return Exchange Form must be filled out and enclosed with your return shipment in order to receive a refund or credit (please call in and have a representative help you with this). All returns are subject to a 25% restocking fee. Contact Rustica Hardware to obtain a Return Exchange Form. If you notice damages or defects to your order once it has been opened and you choose to return the order, you are responsible to re-package the order using the item’s original packaging materials and assure that the product is suitable for shipping. You are required to contact Rustica Hardware within 4 days of receiving your order. We will arrange the shipping of your damaged merchandise back to Rustica Hardware and will re-issue a replacement order. Unfinished door, headers and tables do not have a warranty against warping because of changes in climate that can allow the door to absorb moisture during transit (causing the door to warp). Incorrect finishing of a door can also cause warping which is why we highly encourage our customers to allow us to finish and ship their door pre-assembled. The first and easiest solution that we would suggest to correct a warped door / door table is switching the direction and order of the boards. For example, if the bottom right corner of your door / door table is warped the location of where the warp starts must be first identified. The warping normally occurs in the vertical tongue and groove pieces (b1, b2, b3 etc. referring to direction sheet). Many times it is only one of the vertical boards that is warped which sends the boards to the left or right of the board out of alignment with the rest of the door. In order to compensate for the warp you would flip the warped board or boards and assemble the warp on the top of the door rather than on the bottom. If the door or table is warped on both ends, creating an S warp, then an inverse assembly would need to be done. The bottom right corner would need to be reassembled at the top left part of the door and the same for the bottom left moving to the upper right. In short, you will reverse the assembly process. If you are not able to correct the warp, we would be happy to consider providing a discount on a new door that has a warranty against warping to prevent this occurrence from happening again. In order for us to help with any broken or cracked door slats we will need images of the damages within the first 30 days of receiving the door. We will also need specification for which slats were damaged (determined by using our included instruction sheet). Please provide this information to our customer service department immediately upon receiving your door. For all returns excluding damages and defects, you must repackage the order using the items’ original packaging materials assuring that the product is suitable for shipping. You are responsible to ship the order back to Rustica Hardware. You may use the shipping carrier that is most convenient for you. 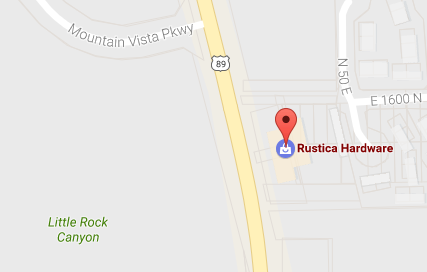 You are required to contact Rustica Hardware about the return within 30 days of receiving of your order. Merchandise returned for customer convenience is subject to a 20% restocking fee. Our experienced Customer Service Representatives are available to talk live with you Monday through Friday 8:00 am- 5:00 pm Mountain Standard Time. You may place an order at any time 24 hours a day 7 days a week using our secure online ordering process. Each and every countertop order is a made to order product and is considered custom-made and as such is not returnable with no warranty. If in the rare case that we did not manufacture your custom block as you ordered, we are happy correct our error within the first 30 days of delivery. Please inspect your block upon arrival to ensure that you have adequate time to notify us of any problems. Rustica Hardware reserves the right to replace any item returned with a replacement model of comparable value or offer a refund for original price of product. Due to the nature of wood there can be slight color/tonal differences from one piece of wood to another. These differences are natural and contribute to the beauty of our product which is why no refund will be issued based on these variations. To avoid damage to your countertop, unsure the countertop is well supported from beneath the countertop. It is not recommended to use our wood countertops in an overhang application with no support beneath the bloc. Rustica Hardware will not replace countertops that break or bow as a result incorrect application and maintenance of the product. Custom products are not returnable.